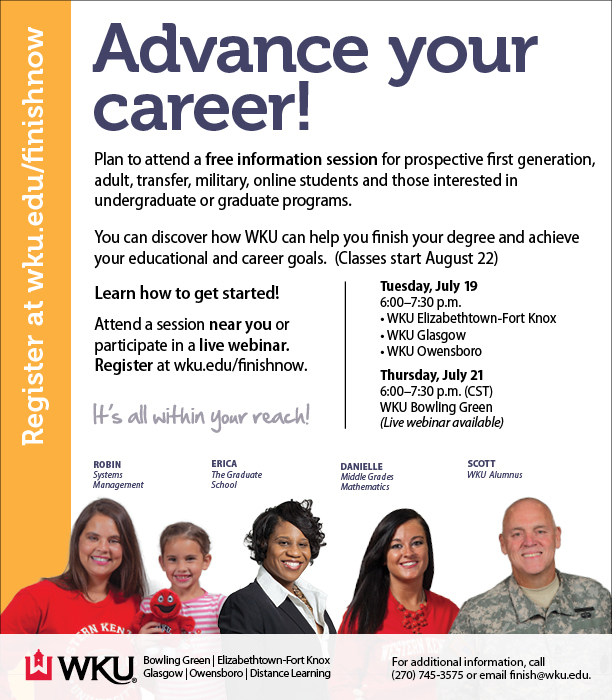 People in the community who want to advance their career can learn how WKU can help them get started at free information sessions in Bowling Green, WKU Elizabethtown-Fort Knox, WKU Glasgow, and WKU Owensboro. Attendees will have the option to participate in person or virtually through a live webinar. Tuesday, July 19, 6-7:30 p.m.
Thursday, July 21, 6-7:30 p.m.
A brief presentation will take place along with a question and answer session. WKU representatives will be present from key academic departments such as Adult Learner Services, Distance Learning, Military Student Services, Student Financial Assistance, The Graduate School and The Transfer Center. To reserve a seat at the sessions, register here. For additional information, call (270) 745-3575 or email finish@wku.edu. WKU has campuses in Bowling Green, Elizabethtown-Fort Knox, Glasgow and Owensboro.